At first, you may skip a payment or two on your credit card payments because you are having a little trouble making ends meet. You intend to catch up the payment next month, but next month you still have trouble making ends meet, so you skip that payment too. Because the effects of skipping a credit card payment are small at first, it is easy to let that payment go if you are forced to choose between paying the credit card bill or paying the utility bill.However, stopping payments to a credit card company has consequences that increase in severity the longer you skip payments. The credit card company may take aggressive actions to collect the debt, including filing a debt collection lawsuit. The first consequence of a missed credit card payment is a late fee. Late fees vary by company, but the average late fee for a credit card payment is between $25 to $38. When you miss the second credit card payment, the company will likely increase the interest rate charged on the balance owed. The penalty interest rate is usually very high. With the increased finance charges and the late fees, the minimum payment on the credit card bill increases dramatically. As more time passes, it becomes increasingly difficult to catch up the missed payments or even make the minimum payment due on the account. When you are a few weeks behind on your credit card payment, the company may begin calling to ask for payment. The calls are infrequent in the beginning; however, the further behind you become on your credit card payments, the more frequently the credit card company contacts you regarding the missed payments. You may also notice the frequency of the letters demanding payment increase too. The tone of the telephone calls and the collection letters become more aggressive as the credit card company begins to threaten legal action to collect the debt. At some point, the credit card company may turn your account over to a debt collector. The debt collector increases the collection efforts. Some debt collectors may call you at work or call the additional contacts you included on the credit card application. The debt collector is prohibited from discussing the exact nature of the call with additional contacts, but they can tell the contact they are trying to reach you and ask them to give you the message. Eventually, the credit card company may turn the account over to an attorney for collection. The company may also sell the account to a debt collector that will eventually turn the account over to an attorney for collection. The attorney may send you one or more letters demanding payment before filing a debt collection lawsuit. The number of times a credit card company, debt collector, or attorney contacts you for payment before filing a lawsuit varies. Therefore, you cannot assume you have a certain number of months after stopping payment to the credit card company before a lawsuit is filed. When a credit card company or debt collector files a debt collection lawsuit in New Jersey, the document filed with the court is called a complaint. The complaint sets forth the allegations that you owe a debt that you are not paying. You must be served with a copy of the complaint and a summons explaining that you have 35 days to respond to the complaint. Your response must be in writing and filed with the court stating why you do not owe the debt. Consulting a New Jersey bankruptcy attorney at this time may be in your best interest. If you do not file a response within the time allowed, the creditor files a motion for default judgment. In most cases, the court grants the motion for default judgment by entering a judgment against you, including fees, costs, and interest on the amount of the judgment. The judgment is entered in the court records and becomes a valid debt against you, even if you had a defense to the lawsuit because you did not respond to the complaint. 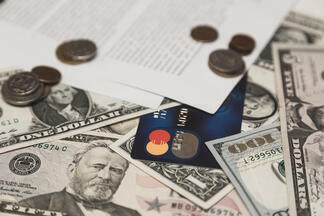 Creditors who have a judgment debt in New Jersey have several ways of collecting the debt. Because the judgment is recorded in the public records, it becomes a lien on any real estate that you currently own or that you may purchase in the future. If you try to sell the real estate or refinance a mortgage, the creditor can demand payment of the judgment from the proceeds of the real estate transaction. In New Jersey, a creditor can also attempt to collect the judgment debt by asking the court to garnish your wages, seize funds from a bank account, or levy personal property. A judgment debt can result in a significant financial hardship if the creditor obtains a wage garnishment order or an order to levy your bank account. A bankruptcy filing may be an option for stopping collection efforts by a credit card company. When you file a bankruptcy case, an automatic stay goes into effect. The automatic stay stops creditors from taking certain actions to collect a debt, including pursuing a debt collection lawsuit, garnishing your wages, and levying your bank accounts. The automatic stay remains in effect throughout your bankruptcy case unless the bankruptcy court modifies the stay. Judgments for credit card debts are dischargeable in a bankruptcy case. Therefore, you can stop collection efforts and get rid of the judgment debt by filing for bankruptcy relief. If you are struggling with credit card payments or other debts you cannot pay, a New Jersey bankruptcy attorney can explain your debt relief options during a free consultation. Filing bankruptcy is an affordable way to eliminate debts you cannot afford to pay.